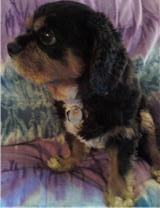 Molly was a Cavalier King Charles Spaniel with a love for angels and energy work. Molly accompanied me to the office each day and the healing she offered was as potent as any other taking place in our counseling suite. She was a wellspring of unconditional love as well as a terrific role model for positive self care. She greeted each person and/or family, offered love and healing, and, later, escorted them out. Molly, however, set her own schedule. She ate and drank when her body indicated a need, she asked for what she wanted & needed, she worked when she felt up to it and she rested when she needed a break (often snoring loudly as she reminded us to care for ourselves in the same healthy manner!). As if that was not enough, Molly attended IET trainings held in the office (about energy healing to release negative emotions) and she then offered her own energy healing during IET sessions! She would, with a client’s permission, during an energy healing treatment, “read their energy system” and then lie on top of them on the massage table in the very place they had a physical or emotional wound in need of healing (without anyone telling her where the problem was)! Our pendulums and personal experience indicated the energy had shifted positively once she had completed her healing work! Molly contributed her Wisdom in each newsletter I published and some of these wise quips are published here in the blog under Molly’s Musings in her memory. We have all been blessed by her love and caring as well as inspired by her healthy spirit and lifestyle.